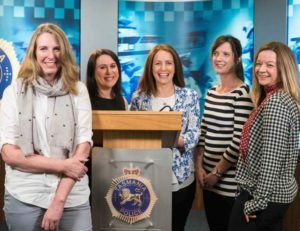 In the male-dominated profession of policing, some may be surprised that the team behind Tasmania Police’s public image is actually all women. Under the quietly astute leadership of Lisa Stingel, the team turns the operational work of frontline police officers into engaging social media content for the masses and works with the media to manage public information. Always preferring to remain behind the scenes, Lisa is the voice of reason and calm when the team whirs into action during a major incident. A former ABC journalist of 17 years, Lisa started in Media and Communications in 2008 when there were just two full-time equivalent roles. She was promoted to the role of Manager in 2014. With a growing focus on social media, an increasingly demanding local media and the need to be ever-ready for a critical incident, she has built a professional team around her to ensure the Department of Police, Fire and Emergency Management is well-equipped. Now comprising seven women in various full-time, part-time and flexible working arrangements, her supportive leadership style allows each member to operate at their best. “We’re an all-female team, though not by design,” said Lisa. “It’s the most collaborative and supportive team I’ve ever worked with. Everyone has children or family responsibilities and we provide flexibility around that; those special assemblies and sports carnivals only come around once. “As a unit we feel our work is valued and supported, from the Commissioner’s office to the Constable who needs some advice before fronting a media conference and that really helps foster a positive working environment,” she said. Above: Media and Communications Unit Manager Lisa Stingel (far left) with her all-woman team L to R: Melanie Simmonds, Emma McGrath, Jemma Ball and Emma Boucher. This page -- https://www.police.tas.gov.au/about-us/100-years-women-policing-tasmania-police/civilian-women-tasmania-police/woman-media-team-behind-public-face-tasmania-police/ -- was last published on February 13, 2018 by the Department of Police, Fire and Emergency Management.